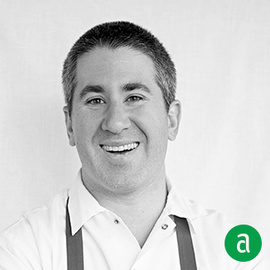 Mike Solomonov, Co-Founder of CookNSolo Restaurant Partners and the executive chef and Co-Owner of Zahav in Philadelphia, shares his career timeline for up-and-coming professionals. Staging at Vetri happened by chance and I wouldn't have gotten hired if I hadn't been there at that exact moment. I feel more and more that timing is everything and had I not jumped on the opportunity to stage at Vetri, while I was working full time at Striped Bass, I wouldn't be where I am today. One of my old bosses told me "if you want to be a chef, you have to think like a chef and if you want to be an owner, you need to think like an owner." It has always stuck with me. I wish I would have started in pastry- pastry experience makes better savory cooks. I like spending time with the entire Zahav staff and I genuinely enjoy working there. I would like to think the staff senses it and hopefully it fires them up. I also ask things, randomly, like "would you bite off your own finger and eat it for 1 million dollars?" which everyone enjoys. Our team keeps me motivated. I'm also motivated by the possibility of failure. My mentors are Terence Feury, Marc Vetri and Jeff Benjamin. Terence Feury simply taught me how to cook, and taught me about personal standards, and the need to always elevate them on an individual level, without someone standing over it. Marc Vetri and Jeff Benjamin taught me about hospitality, how to make people incredibly comfortable, and taking the ego out of what it is we do.